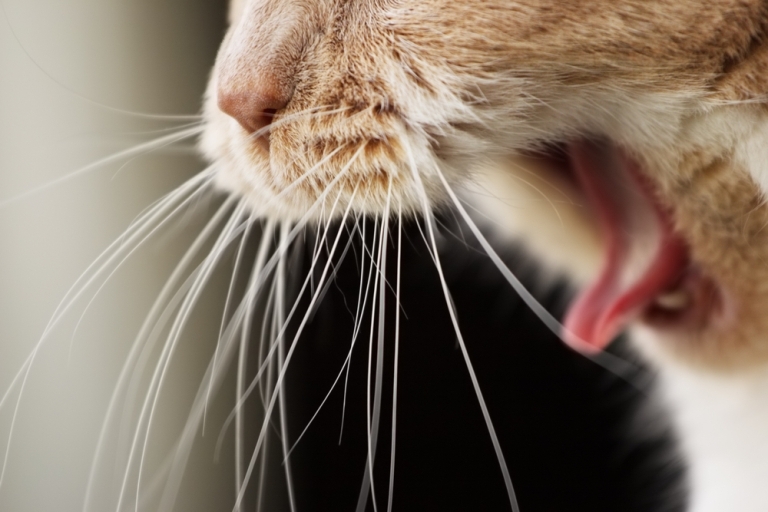 Ask a Vet: Why Do Cats Cough? 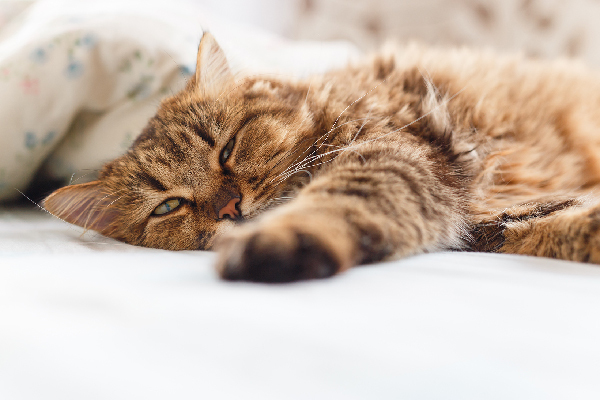 Every cat coughs some, but long-term frequent coughing can be a sign of a serious problem. We all know what coughing is because we’ve all done it. A perceived tickle, irritation, or pain in the throat causes a violent, noisy exhalation. Cats cough, too. It is normal to cough every now and then. Occasional transient irritation of the trachea (windpipe), throat, or lungs can cause an intermittent cough in humans or cats. Coughing is common during meals as well — if a fragment of food starts to “go down the wrong pipe,” a few strong coughs eject it and protect the lungs from its entry, which would lead to pneumonia. Every cat coughs occasionally. But certain individuals cough more often. Some of them cough regularly throughout their lives, at a rate that is not normal. What are the potential causes for this? People with significant canine experience know that heart disease is a common cause of coughing in dogs. 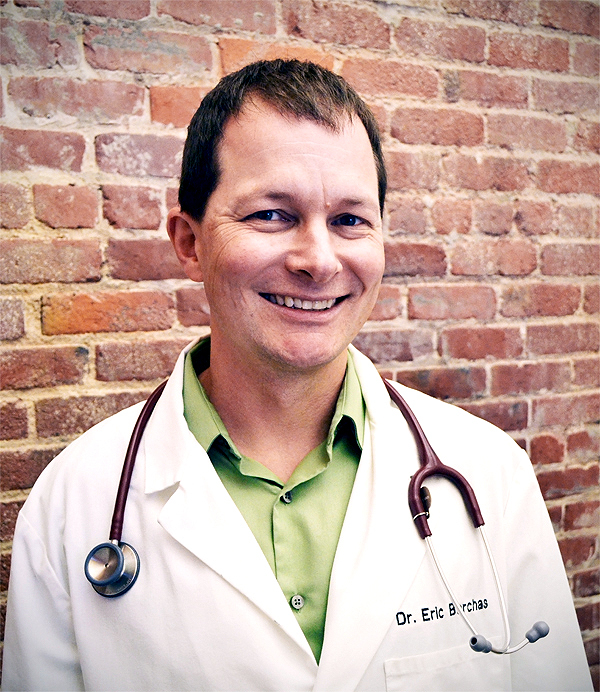 Cat owners should know that feline heart disease rarely causes coughing. 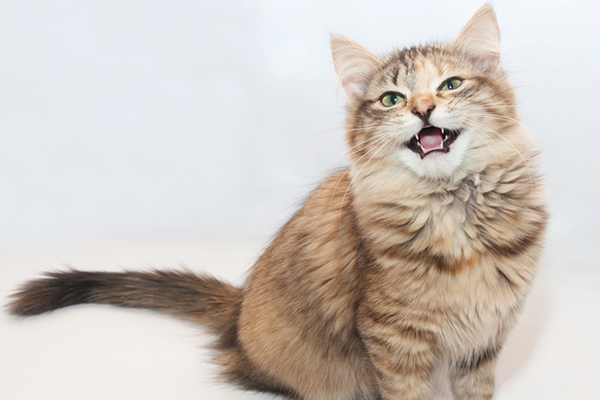 Could a hairball be the cause of a cat’s frequent coughing? Absolutely not. Let’s clear something up right from the start: Hairballs do not cause coughing. No doubt the term “coughing up hairballs” was invented because cats appear to be coughing when they bring them up. But they’re not coughing. They’re vomiting. Coughing is a function of the respiratory system. Coughing occurs if there is irritation or pathology in the throat, voice box, airways, or lungs. Hairballs do not develop in the respiratory system. They develop when hair that is swallowed does not pass normally through the gastrointestinal tract. These hairballs may ultimately, with much drama and ado, be brought up and expelled through the mouth. But they originate in the gastrointestinal tract, not the respiratory tract, and they are produced through vomiting, not coughing. In cats it can be hard to differentiate between vomiting and coughing. Both cause the sides to heave, and both cause substantial noise — every cat owner has been awakened by the unpleasant cacophony of a cat vomiting or coughing in the dead of night. How can one tell whether one’s cat is coughing or vomiting? The simplest way is to see what comes out after noisy episodes. If food, hairballs, or bile is produced, then your cat is vomiting. If nothing ever comes out, or if only a small amount of mucus or clear foamy liquid is produced, then your cat is probably coughing. Also, coughing generally causes cats to undergo a series of nearly identical chest heaves. Vomiting often causes fibrillating abdominal contractions followed by generalized heaving. If your cat regularly suffers from noisy episodes and you can’t tell whether she’s coughing or trying to vomit, then embrace modern technology: Get a video of an episode with your smartphone and take it, along with your cat, to the vet. Let’s say that you’ve determined that your cat is a regular cougher. What could cause that? To answer the question, we must first differentiate acute coughing from chronic coughing. 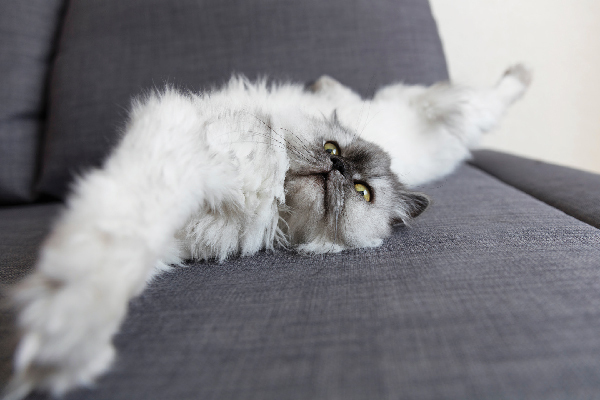 Previously normal cats who suddenly start to cough often have respiratory infections. 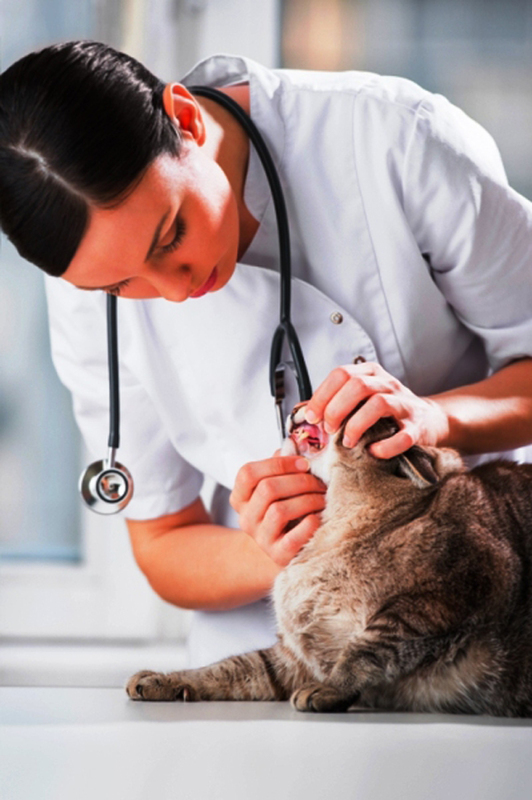 Upper respiratory infections are very common in cats. They often cause coughing, watery eyes, and nasal discharge. Foreign bodies in the throat or more serious lower respiratory infections (infectious bronchitis or pneumonia) also may cause sudden onset of coughing. In older cats, cancer that has spread to the lungs rarely is a cause of sudden onset coughing. However, cats who have long histories of coughing more frequently than average without a sudden onset or increasing trend almost always can be diagnosed with the same condition: feline bronchitis, also known as feline asthma. Granted, certain respiratory infections, heartworm disease, and migration of other parasites through the lungs occasionally cause this type of coughing as well. But in the developed world, such infections and infestations are not as common as feline asthma. Feline asthma, like human asthma, is a condition in which the immune system becomes overactive. The excessive activity is focused on the respiratory tract, leading to chronic inflammation of the pulmonary airways (tubes that conduct air into and through the lungs). It causes swelling and irritation of the airways, which can result in coughing. More troubling, asthma can lead to acute crises. If the swelling of the airways progresses to the point that they swell shut, then life-threatening respiratory distress can occur. Because of this potential, it is important for all owners of regularly coughing cats to have their pets checked out by a vet. Radiographs (X-rays) often can confirm the diagnosis. In some cases more advanced procedures, in which fluid is flushed into the lungs and then removed and analyzed, are necessary. Heartworm testing, as well as general blood work and tests for other parasites, will likely be recommended. Treatment of feline asthma is focused on reducing coughing and improving quality of life, and also especially on preventing life-threatening crises. The most basic treatment is avoidance of allergens that can stimulate the immune system and exacerbate the irritation in the airways. Fleas always are the No. 1 allergen in cats, so good flea control should be implemented even in cats who do not have visible flea infestations. Dietary modification and avoidance of environmental allergens (such as mites and pollen) may help as well. A number of medications are used to treat significant feline asthma. Immune system modulators such as prednisolone (a type of steroid) and cyclosporine are often utilized. Injectable steroids such as Depo-Medrol are used for some cats who do not tolerate oral medications. However, owners of cats with asthma should be aware that steroids, especially of the injectable variety like Depo-Medrol, have the potential to cause significant adverse effects in the long run. Bronchodilators such as terbutaline and albuterol are sometimes administered orally to cats with asthma, but use of bronchodilators alone generally is not recommended by experts. In my experience the most effective treatment for confirmed cases of feline asthma is fluticasone propionate, also known as Flovent. It is an inhalable steroid that acts directly on the airways but has minimal systemic effect. It is thus generally less likely to cause side effects than oral or injectable steroids. And, surprisingly, it’s generally not hard to administer. Vets can obtain an item known as a spacer that can be used to connect the Flovent puffer to the cat. Cats generally tolerate administration of Flovent better than oral medications, and for many cats a couple of puffs each week is all that is needed to control the condition. If your cat is a regular cougher, she should see the vet for an exam and the tests mentioned above. Coughing has the potential to progress to life-threatening respiratory distress, and it’s best to identify and treat the cause before things get out of hand.